Thomas Randolph was a nephew to Robert the Bruce. 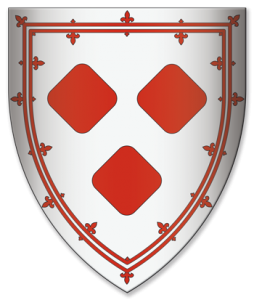 His father was Sir Thomas Randolph of Stichill, Roxburghshire, and his mother was a half-sister to Robert the Bruce, being a daughter of Marjory, Countess of Carrick and her first husband Adam of Kilconquhar. Marjory was the mother of Robert by her second marriage. He had a very active military life, being present at many battles such as Methven, Line Water and Bannockburn. At the battle of Methven in 1306 he was captured by the English forces and changed his allegiance to Edward I, perhaps to save his own life. He was then captured by the Scottish at Line Water in 1308 and apparently argued with his uncle Robert the Bruce, but all was well between them by 1314 when Randolph helped with the siege of Edinburgh castle. At Bannockburn he played a crucial role for the Scottish side. He was in charge of the Central Division or Vanguard and there is a place known as “Randolph’s Field” after his men formed a circle with spears outwards at that place. In the 1320s he played an important role in negotiations with both France and the Papacy and remained one of the King’s most trusted advisors for the rest of Robert’s reign. When Robert the Bruce died in 1329, from leprosy, Randolph was made the Guardian or Regent for David II. The poet Barbour describes him as “Middle height, broad face, pleasant and fair”. He married Isabella Stewart, the daughter of Sir John Stewart and Margaret de Bonkyl and they had at least four children, Thomas, Agnes, Isabel and John. Agnes, known as “Black Agnes”, maintained a 19 week siege in January 1337/8 when the castle of Dunbar was being attacked by the English. Thomas died on 20 July 1332, and was buried at Dunfermline Abbey.